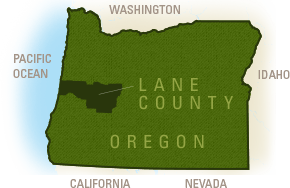 Lane County is the fourth most populous county (following Multnomah, Washington and Clackamas counties). Since the 1980s, population in the Eugene, Cascades & Coast region has been growing at a slow, steady rate. Eugene is the designated county seat. In 2008, Portland State University conducted a Population Forecast for Lane County 2008-2035. This report is full of statistical information about Lane County and the Eugene - Springfield populous area. *McKenzie River is unincorporated. Source: 2018 Rural Development Initiative.